Part 11 of Susan Deal's "Forward Riding Series - Exercises for a Rider's First Year"
In Susan Deal’s 11th topic from her video series, she works with two young riders at different stages of learning their diagonals. As the result of early horse show competition in her young riding career, the first student has learned to look to determine her diagonals and is in the process of learning to feel them instead. Her second rider was taught to feel the rhythm of her pony’s trot and easily pops up on the correct diagonal every time without looking. Equine activities can be hazardous and may subject participants to injury. 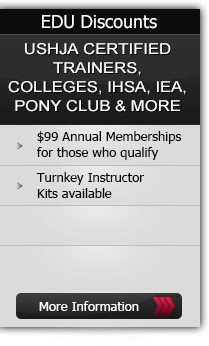 Neither Equestrian Coach, LLC nor Susan Deal assume liability for your activities. This program provides general instructions and techniques that may not be suitable for everyone. No warranty is given regarding suitability of these instructions to the viewer.